Do you have a good shaving mirror in your shower? If you hope to shave while you are in the shower and do a decent job, you will need to find a good mirror that doesn’t fog up. If you want to choose the best shaving mirror, you should be as informed as possible about the types that are available. There are more options than you ever could have imagined. That’s why I put together this buyer’s guide. To help inform others of the options available so they can find the best option for them. What is the Best Bathroom Shaving Mirror in April, 2019? Jerdon J2020C 2-sided mirror 30” 5x 360-degree Plastic 1-year limited warranty 8.3"L x 6.5"W Check price! Miusco 7x C3079 2-sided mirror 13.5" 7x 360 degrees Plastic Base is made from flimsy plastic material 7 ¾" round Check price! JiBen Fogless Shower Mirror 1-sided mirror - - 360 degrees Chrome Powerful suction cup included, no fog, built-in razor hook 5.75" round Check price! Modern Man SYNCHKG115949 1-sided mirror - - 360 degrees Chrome No fog, includes razor holder - Check price! Shave Well Company SW-003 1-sided mirror - - No rotation Unbreakable No fog, easy to clean 4"W x 1.8"D x 6"H Check price! SONGMICS 8” 2-sided mirror 12" 5x 360 degrees Brass, stainless steel and high polished chrome Too heavy for bracket 8" diameter Check price! Mirrorvna Fogless Shower Mirror 1-sided mirror - - No rotation Unbreakable No fog 6.3"W x 6.3"D Check price! No Fog Shower Mirror 1-sided mirror - - 360 degrees - No fog, separate razor holder 6.5" diameter Check price! DecoBros 8” 2-sided mirror 13.5”-23.3” 7x 360 degrees Nickel Will rust 8" diameter Check price! Axor Hansgrohe 42090820 2-sided mirror - 2.5x 360 degrees Nickel Strong hardware to pull the mirror out 7" diameter Check price! Goody Hand Mirror 1-sided mirror - - - Plastic - 11" large Check price! The Jerdon J2020C had a wall mounted design with a chrome/white finish and a 30” extension. This two-sided mirror measures 8.3” by 6.5” and has a smooth swivel design allowing for 360-degree rotation and features 5x magnification. The extension is made up of a scissor arm design that even when fully extended provides a firm hold. It stands out with a sleek and modern look. It seems like the mirror is just a little to heavy for the extension arm when it’s fully extended. The non magnifying side has no distortion in the mirror. When you look in you see a clear picture there anytime. It matters if you need to see the details. In the box you have the mirror, the wall mount and an instruction manual in many languages. The mounting hardware looks like two wall anchors with two screws. And when you see it, there is a desire to immediately mount this mirror. Than choose a place to install. This mirror can move and there should be enough space for its movement. Imagine how you will use it. Keep this in mind and start the markup. Rest the mounting base against the wall and level it. Take the pencil and mark the points for the anchors. 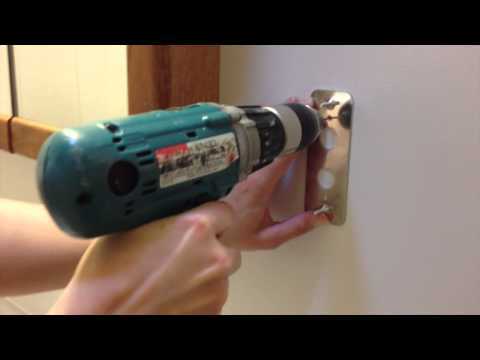 Make holes with a drill. If you use a quarter-inch drill bit, then the holes will be a bit large. Just wind round five six turns of masking tape on the top of anchor to make it a bit thicker. This will prevent rotation. Hammer the anchors into the wall. Fix the base with screws. Confirm vertical position with level. It’s ready to use! After all this mirror not only convenient but easy to install too. Usually, it used in SPAs and luxury hotels due to its sleek look, convenience, and magnification. It has a 1-year limited warranty. The Jerdon company is continuing to build position in the market by improving existing lines with the latest in technology, and by developing new products to meet the needs of its growing customer base. Jerdon J2020C – this product is a good choice for shaving with the 5x magnification and 30” extension. The Miusco 7x C3079 is a double-sided mirror that has 7x magnification on one side and 1x on the other. There is a 13.5” extension arm for this 7 3/4” distortion free glass. The magnification provides you with a view of your whole face in extraordinary detail. It has a stylish chrome finish and provides a full 360 degrees of rotation. Is also weighted for better stability. This double-sided mirror is another good option with the 7x magnification. The JiBen Fogless is made out of high-quality plastic meaning that it is shatter-proof. This high-quality plastic will not rust or crack. It has a razor-hook built-in. It comes in nice packaging and it`s got a 360-degree swivel. On the package just shows the steps for locking the mirror in place. The glass is very clean. Its reverse side also has a glossy mirror coating. This makes it very stylish. It holds on the knob with hinge. The hinge rotates the mirror on its axis. A small base of 3 inches has locking mechanism and provides a good suction. You can mount the mirror anywhere with a flat surface. You can also easily move it or take it to rest. This mirror becomes universal, due to the diameter of 6 inches. The main feature of this is that it does not fog up. Don`t use a towel to wipe the surface because the anti-fog effect will fade. It is enough to wash it with warm water. Follow our recommendations, and you will quickly and easily install it. Choose a flat surface in your bathroom or in another place where you want to install a mirror. Put that on the wall and then just turn the knob. On the base there is a knobby just turn it clockwise. And it just locks in place. When you hear a click, it locks in place. Now you can move it to the right or left, and the mirror is securely fixed. If you need to unfix the mirror, simply turn the base knobby counterclockwise. This lightweight device is perfect for someone who is traveling. The JiBen Fogless can be attached and detached easily. Only 3” of area is needed for the section lock. The portability of this product makes it another solid choice. The Modern Man SYNCHKG115949 provides a look of class. The size of this mirror is just about perfect. It is lightweight and easily attaches to the wall. It is a durable and fog-resistant that includes a flexible arm that allows you to change the position quickly and easily any time you need to. This is also able to tilt up or down allowing multiple people to use it without needing to remove it. It comes with a plastic razor holder. This classy mirror is fog free allowing you to shave while you are in the shower and still see yourself clearly. The Shave Well Company SW-003 is the best shower shave mirror available because of its unique design. It is easy to clean and won’t fog up on you. This tool is unbreakable and is a perfect size. It’s small enough to be taken with you while being large enough to see a clear reflection of your whole face. In the package you will find the mirror, the plastic back, the suction cup and installation instructions. The manufacturers recommend to keep the plastic back. It will prevent the mirror from getting scratched up if you do a lot of travelling. Also they claim that the mirror is unbreakable. How to use and install it? Since is light – the suction cup can easily hold it. And what do you do next? Put the suction cup in the hole. Then put the suction cap with the mirror on the glass or your tile. By holding the mirror under the shower’s stream allowing the temperatures of the shower for several minutes and the mirror to equalize you get a fog-free reflection that lasts a long time. Clean it by getting it wet and adding a small amount of toothpaste. It will still look like it’s new after you have used it for years. The Shave Well Company SW-003 is 6” tall by 4” wide. It is 1/8” thick. The suction cup is 1.78” in diameter. The best place to get a close and comfortable shave is in the shower. The unique design of the Shave Well Company SW-003 forever will change how you feel about shaving while in the shower while on the road. This mirror is a perfect size, and the portability of it is great. The circular Songmics dual-sided mirror has an 8” diameter. It features a smooth swivel design that provides 360 degrees of rotation and can be adjusted to be viewed at any angle. Powerful magnification of 5x allows you to see details while the 1x is suited for all-around use. SONGMICS 8” has an attractive nickel finish that won’t corrode. Also it is fordable mirror. It has extension which consists of two arms – short and long. Together they allow the mirror to extend 12 inches from the wall. The arms can also be rotated 360 degrees horizontally. This gives a lot of mobility to the mirror. But it is not portable, like the previous models. You must attach it to the wall. Its base is not small. You need a space of 4.92 by 2.5 inches to install it. Therefore, determine the exact location before installing. It’s practical, and elegant design is suitable for applying make-up, putting in or taking out contacts, and shaving at luxury hotels. This dual-sided 8” mirror offers 5x magnification that will allow you to see exactly what you are doing while you are shaving. The Mirrorvana Fogless is unable to work properly if it doesn’t have a flat and smooth surface to attach to, like marble, enamel, acrylic, fiberglass, ceramic, or porcelain. This fogless mirror is made from quality materials and has long-lasting durability. This adjustable mirror moves easily without needing to remove the suction cup from where the base is secured. The Mirrorvana Fogless is small and light as well as shatter-proof. To keep it safe, make sure you follow the installation instructions exactly. At first make sure that you`re installing this mirror on a dry clean flat even non-porous surface. The glass windows, granite, marble, tile are suit for this. Don’t install it on an uneven, porous or gritty textured surface. In these cases, there is a chance of dropping the mirror. Pay attention to the base of it. It has an advanced suction mechanism that again so simple to use. Make sure that the mechanism is turned all the way to the unlocked position. Turning it all the way to the left counterclockwise. Next you`re going to apply it to a dry clean non-porous surface. Then you`re going to turn it clockwise and hear a snapping sound. Now you can get a shave from many different angles. Also, you can use a wall mount sticker. It comes with mirror too. To mount it, you also need to follow the rules. Mount it on a smooth, dry, clean surface. You`re going to take up one side of the wall mount digger. Once that`s off. Make sure to put this on the exact spot you want to. You go to apply firmly. Then very simply you`re going to take off the other side of the wall mount sticker. Again making sure that the mechanism is also turned all the way into the unlocked position. You`re going to adhere the suction cup position directly on the wall mount sticker. Press firmly. Then turn all the way to the right clockwise until you hear the locked sound. The anti-fog coating can worn off. You must periodically respray with a leading anti-fog spray that is compatible with plastics. Make sure that this mirror is not in direct contact with water and away from streams of water. When you take a shower just lower the head of the mirror down. Don’t use abrasive chemicals like shampoos, rubbing alcohol. Make sure that you do not install it close to your showerhead, or the coating that stops the mirror from fogging up will come off. Other than that, it is a good choice for your shaving needs. If you cannot get the mirror to work or are not satisfied for any reason at all, use the guarantee. Mirrorvana will offer it full replacement or full refund without you having to send the mirror back. All you need to do is send an email to Mirrorvana and they will take you the rest. The No Fog will ensure that you have an amazing fogless experience because it is one of the best no-fog mirrors that are available. It is suitable for surfaces that are flat like ceramic, marble, enamel, fiberglass, acrylic, and porcelain. This is an outstanding product with a low price. It will offer you an excellent fog free shaving experience. It has a separate razor holder you can place anywhere you wish. There is an adjustable swivel arm that allows you to get it much closer than other mirrors can. This shaving mirror is a great deal and is one of the best no fog options around. The DecoBros 8” two-sided wall mounted mirror has an eight-inch diameter. It provides a 7x magnification on one of the sides and includes a 13.5” extension. It has a high-class nickel finish that looks great. It is also able to rotate 360 degrees on a smooth swivel design. This has a higher quality than the other products with similar features. I would recommend it more than the others. The Axor Hansgrohe 42090820 is part of a very stylized bathroom collection that emulates the early 20th century. This is a double-sided swivel mirror with a magnification of 1.7 times, mounted on the wall. Therefore, before installing, choose such a surface so that it sustains its weight in 970 g.
In the box you will find the mirror, installation instructions, mounting set, support element, hexagon socket screw M4x10 and pin. During installation, follow the instructions exactly. It looks great and has a comfortable size. The extension consists of two movable arms with a total length of 10.5 inches. Side size is 6.8 inches in diameter. And the installation base requires an area size of 4.8 by 2.1 inches. Yes, it does not have such a large magnification, but it will suit aesthetics lovers. It is paying homage to the sophisticated spa resort located on Lake Geneva. It is of the highest quality and has the highest price of any mirror on this list. This mirror is too expensive even to consider unless you are awfully rich. The Goody Hand measure 11” from the bottom of the handle to the top of the mirror. It actually made out of glass. The mirror part is 7 ” across and vertical it is 5.5 ‘‘. This is a convenient size that allows you to see the whole face. A nice feature of this product is that it comes in different colors. Just choose the color before purchasing. This mirror is budget and fits if you are looking for a handy one. There is enough information provided about this hand mirror to make a final decision on, and it looks like a good product. Now that you’ve looked at some of the options let’s get into the guide. If you want a mirror you can use in the shower to help you shave, it will have to be a fogless mirror. I’m sure that you have noticed the fog that forms on your bathroom mirror when you’re taking a hot shower. Even if you turn the exhaust fan on, the warm moisture in your bathroom makes a vapor that covers your mirror making it impossible to use. Your only options are to open the bathroom door and let cold air in or constantly wipe the fog off of the mirror. A fogless mirror will not have this condensation while you are in the shower. Fogless mirrors receive extra heat that helps prevent fog from forming. The extra heat stops the condensation for settling on the surface of the mirror since it’s warmer than all of the water vapor in the atmosphere around it. This allows for you to have a clear reflection, even though you are in the shower. Fogless mirrors have water inside that helps to regulate the temperature to where it needs to be. For the mirror to work, you will have to empty the water out after you use it and fill it back up when you want to use it again. The first type of fogless mirror is powered by electric. It works similar to how the rear defrost in your car works. The electrical current heats up causing the condensation to disappear from the mirror. It’s not safe to have an electric current while you are in the shower, so mirrors were made that have a compartment for water. When you put hot water in, the water warms the mirror allowing the surface to stay clear. A large part of the fogless mirrors available hang from the faucet. They are very light, so there are no worries about them messing up your plumbing. Others can be mounted on the wall of your shower. There are even handheld options available on the market today. So, now that you know how they work, you simply have to choose the one that has good quality and is affordable enough to work with your budget. If you need a mirror that doesn’t move and that stays in your shower all of the time, a mounted shower mirror is perfect for you. These wall mounted mirrors are connected to the wall with screws, strips of glue, or suction cups. This options leaves your hands free and is sturdy so that it won’t go anywhere. If you want something more convenient, a hanging mirror is a perfect choice. This mirror simply hangs from your shower head from a hook. It is easy to use in any bathroom that has any size water pipes. An added benefit of a hanging mirror is that it is portable. You can remove it from your shower when you are done and take it with you. This is perfect if you have more than one shower or if you are out on the road. You can easily use a hanging mirror in any shower that you use. Stand alone shower mirrors can be used anywhere as well. This is just a hand mirror that you can place on certain surfaces with a suction cup or hold. You can set them on the counter, hang them on the wall, or hold it yourself when you need to use it. The biggest advantage of having a fogless shaving mirror is having the ability to shave in a hot shower and still be able to see what you are doing. The environment that you have created works for you to allow you this luxury. The natural heat around you from the water vapor actually increases the circulation of blood closer to the skin creating softer skin that’s more receptive to being shaved. This hydration allows for the removal of dead skin cells during the shaving process. This is sort of like giving yourself a beauty treatment. There are many products available today that feature a clock display informing you of the time while you are in the bathroom. You won’t need to worry that you’ll be late for work, not making your appointments, or taking such a long morning shower that you make your kids late for school. Including a fogless mirror in your shower helps you to save time in the long run because you don’t have to make two separate stops in the morning. You can do everything in the shower which can speed up your process of getting ready. You will have a quicker routine of getting groomed and getting dressed, leaving more time for other things like eating breakfast or spending time with your family. Having a couple of these mirrors stashed throughout the house can save you time you currently waste waiting to use the mirror in the bathroom. If you have another on in your room, you won’t have to wait any longer. There are also lighted shaving mirrors that can help out in a dark situation. You will have to make sure that the batteries you have in it are charged, but they will provide you hours of light. The best fogless shaving mirrors have some features that you will not want to do without. Here are different things you can consider when looking for the right mirror for your situation. You will want a mirror that is wide enough to show everything that you want to see while you are shaving in the shower. If it is too small, you will have to adjust your position which can cause difficulties constantly. The weight is important. If it is too heavy, it won’t want to hang well and will cause more trouble than it is worth. Find a mirror that is light and of a big enough size to be useful. Mirrors that provide magnification are mostly used by woman when they put makeup on. This gives them a closer look at the job they are doing and allows them to focus on detail. A mirror with some magnification could also be used to help you shave. It will probably happen too many times to count. Either the suction cups holding your mirror onto the wall will lose their grip, or you will simply drop the mirror while you are trying to remove it from the wall. Luckily, the majority of these mirrors are resistant to shattering and will only incur minor damages. That’s it. These eleven reviews hopefully shed some light on some of the different options available to you. Hopefully, the buyer’s guide helped you to pick out what you are looking for in a shaving mirror. Remember to keep all of those characteristics in mind while you are shopping and find the mirror that offers you everything that you are looking for.